Just 64 days after taking her seat in the Nova Scotia Legislature, newly elected Liberal MLA Pam Eyking left Canada for a 28-day family trip to Australia and Taiwan. Eyking and her husband Mark, MP for Sydney-Victoria, left Canada on Boxing Day. Her office said she is expected back in Nova Scotia Thursday, the 23rd. Contrarian learned about the trip from a prominent Cape Breton Liberal who asked not to be identified, but said party members are annoyed at her taking a long foreign vacation so early in her term as MLA. Elected October 8, Eyking was sworn in as MLA October 22. Longtime Liberal MLA Manning MacDonald resigned his seat last May after his decision to take a month-long Florida vacation while the house was sitting came under fire. The house has not been in session during Eyking’s absence. 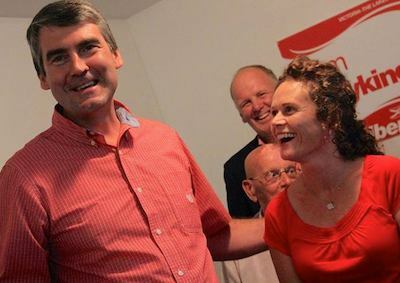 Laurel Munroe, communications advisor to Premier Stephen McNeil, said the Eykings spent two weeks in Australia visiting “their son, who lives there,” then continued on to Taiwan where Mark Eyking is on “a Parliamentary trip.” She said did not have details on any Parliamentary business he was conducting, but said such trips are common for MPs. A staff member in Mark Eyking’s Ottawa office who did not know the nature of the MP’s business in Taiwan offered to have a staff member who did return Contrarian’s call, but the other staffer did not call back. Facebook pages of Eykings’ two sons list both men as Ottawa residents, but photos show one of them at an Australian surf camp in late October. She did not respond to questions in a follow-up email seeking details about the meetings and comment on the propriety of leaving the country for an extended trip so soon after her election. She did offer to meet after she returns to Cape Breton. Cape Breton University President David Wheeler did not respond to emails seeking details on any meetings Eyking is attending for the university in Taiwan. confirmed Monday that university officials “did speak to Ms. Eyking about making links for CBU in Taiwan before her departure.” The Cape Breton Tourist Association ceased to exist in 2007. The island’s tourism industry has been represented since 2003 by Destination Cape Breton.